Mokhtarieh, A. (2017). Evaluation of Human Adipocyte Stem Cells Telomere Length in Early and Late Passages by Quantitative PCR and Southern Blotting. Journal of Applied Biotechnology Reports, 4(1), 527-531. Amir Abbas Mokhtarieh. "Evaluation of Human Adipocyte Stem Cells Telomere Length in Early and Late Passages by Quantitative PCR and Southern Blotting". 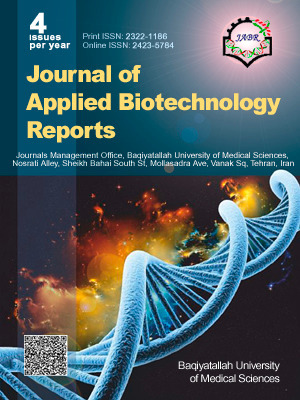 Journal of Applied Biotechnology Reports, 4, 1, 2017, 527-531. Mokhtarieh, A. (2017). 'Evaluation of Human Adipocyte Stem Cells Telomere Length in Early and Late Passages by Quantitative PCR and Southern Blotting', Journal of Applied Biotechnology Reports, 4(1), pp. 527-531. Mokhtarieh, A. Evaluation of Human Adipocyte Stem Cells Telomere Length in Early and Late Passages by Quantitative PCR and Southern Blotting. Journal of Applied Biotechnology Reports, 2017; 4(1): 527-531. Stem cells are valuable for cell therapy. One of the important disadvantages of stem cells for cell therapy is stem cell senescence. Based on the reports, cell division causes telomere attrition and shortening which this in turn leads to cell senescence. Telomeres are short sequences at the both end of chromosomes that hinder chromosomal attachment. Since pluripotency of stem cells reduces by each cell division, one can conclude that the telomere shortening of stem cell by passaging is inevitable. Here we decided to evaluate the relation between the telomere length and cell passages in human adipocyte stem cells (hAdSCs) by qPCR and Southern blotting. For this purpose, first the AdSCs were isolated from adipocyte tissue by collagenase digestion. Then isolated hAdSCs were subjected to flow cytometry to purify hAdSCs from the rest of adipocyte cells by means of expression of surface markers such as CD105, CD90, CD73 and CD43. Purified hAdSCs were subcultured till appropriate passages (passage 2 and 17). Genomic DNA of appropriate passages were extracted and subjected to both qPCR and Southern blotting for telomere length measurement. Based on the results, hAdSCs telomere length in the passage 2 was much longer than passage 17. Moreover, the longer telomere length in passage 17 was confirmed by Southern blot. Our results indicated that telomeres attrition occur in hAdSCs by each cell division.